We have now released our updated 5 Watt models where we in our continuous work to make better products have switched from a single LED chip lamp to a so called COB (chip on board) solution. By doing so we have been able to improve on mainly two different things both in regards to function and aesthetics. With our new model we have increased the number of chips by a factor of two allowing us to have better precision on how we customize our spectrum ratio which in turn brings the CRI (color rendering index) up at the same time as we better customize the wavelengths suitable for plants. The 5 Watt COB has been standardized and its the same type of board used in both our E14 as well as in our GU10 socket lamps. Our overall concept for developing grow lights is that the spectrum should should simulate white light as closely as possible simply because these are natural conditions under which plants have developed but also because we want our lights to be functional under normal indoor conditions. Normally grow lights only contain red and blue wavelengths so to mainly just stimulate chlorophyll production, but this is simply not enough for anyone using LED for regular indoor plants as at least one third of the spectrum is missing from such a lamp that in extent does not reflect all the visible colors. Under darker conditions these types of red and blue lamps also induce eye strain which is completely avoided by using a full spectrum lamp from us. 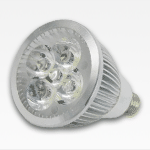 The extremely low power consumption makes this light ideal for year around use. This lamp is suited to fit regular E14 sockets and works great for any indoor plants that need extra support where natural light is lacking. It can also be used for the smallest of indoor grows but should in such a case only be used for green plants like basil, oregano, chives etc.